Never had my nails professionally done because I’m all about DIY projects. There’s something really rewarding and relaxing about giving yourself a manicure. 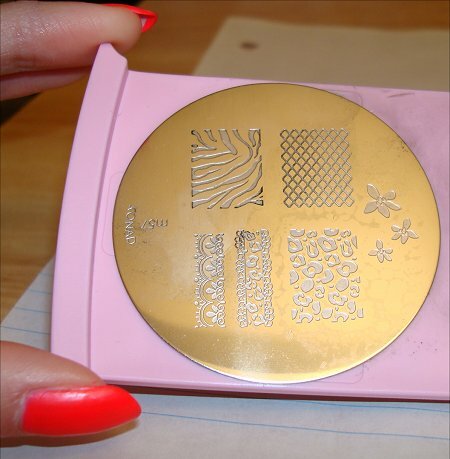 Konad revolutionized the nail industry with their stamping kits. If you’re new to the wonderful world of Konad like I am (or even if you just want to pick up some tips and tricks), keep reading for my step-by-step Konad tutorial that includes written instructions as well as visual aids to make it simple to follow along. I’ll also provide you with an in-depth Konad Nail Stamping Kit review on all the products I’ve mentioned including the Konad Image Plate, Special Polish, Stamper, Scraper, and Image Plate Holder. Make sure you have everything you need within arm’s reach. Cover the work surface with a piece of paper or something that you don’t mind getting dirty. Partially unscrew the caps of your nail-polish bottles to avoid later having trouble with hard-to-open bottles when your nails are painted. Place your Konad Image Plate in the Holder (if you have one). After your last coat of polish, let it dry completely. 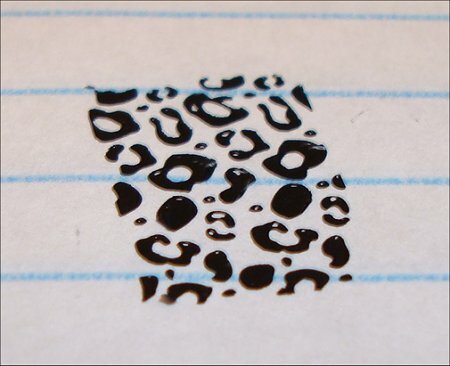 This is crucial because stamping onto still-wet polish will destroy your manicure. You’ll see that I repositioned the image disk. Forgot to do that before. (Hey, I’m still learning myself!) You want to position the design you’re using so you can scrape the polish off and away from the plate without putting the discarded polish onto another design. Hold the Konad Scraper and carefully sweep it across the design. You don’t have to press too hard…just hard enough to remove the excess polish. Applying too much pressure will take off too much polish from the engraved design. Too little pressure won’t leave a clean image. Wipe your scraper onto your piece of paper to remove excess polish after each time you scrape. After doing this, you really need to work fast or the polish will dry up and not transfer on your nail properly. Now for the fun part! 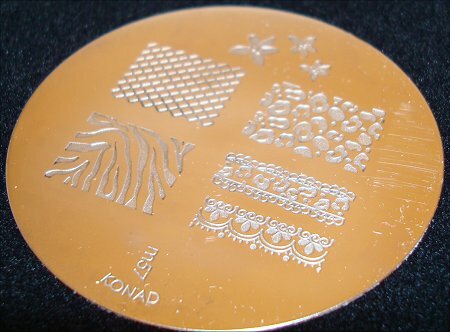 While holding the Konad Stamper, firmly press down on the design. Check to make sure you picked up the entire design and that there aren’t any faded areas. Below is a good example of what you want to see. All the areas are filled with polish. If you didn’t pick up the entire design, simply stamp the design on the paper you’ve laid down to remove it. If it doesn’t all come off, you can use your cotton ball soaked in remover to clean it. 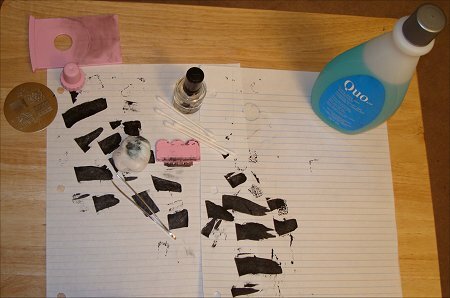 Then stamp a few times on your paper to get rid of any polish residue. If the image you’ve picked up on your stamper looks good, test it out on your piece of paper. Practice a few times so you get comfortable with how much pressure you need to apply to achieve the best image. 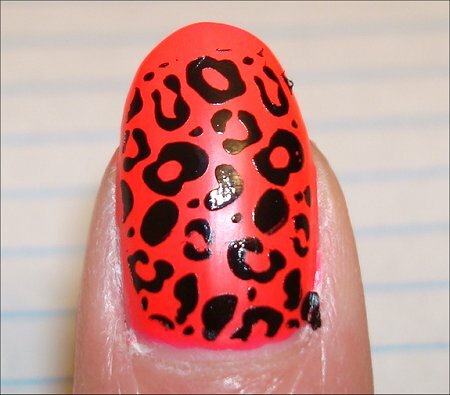 Then, when you’re ready to do it on your actual nail, go for it! Be sure to only use fresh stamping (i.e. new polish, new scraping, new image-picking-up) for ideal results. To transfer the design from your stamp to your nail, you’ll want to apply even pressure to your nail as you roll the Konad Stamper from one side of your nail to the next. Do it in 1 smooth motion. You’ll notice that in the below image, the tip of my nail is bare. To avoid this mistake, be extra careful when stamping full-nail designs and look at the stamp to make sure it’ll fit over your entire nail before stamping. Repeat Step 9 with the rest of your nails (if you want the same design on all of them, of course). It’s a good idea to use your cotton ball to clean the plate after each time you’ve used it to get rid of any dried polish still stuck in the engraved design. But once you get faster at doing Konad designs, you can probably just clean the plate every few stamps. Don’t worry about stamping onto your skin. And never mind those bits that may stick over the edge of your nail for now. If you have bits hanging over the edge of your nails like I did, you can carefully remove them with the pads of your finger. Wait for the Konad Special Polish to dry before slicking on your top coat. If you don’t wait long enough, you’ll risk causing streaks/smears in your design. I suggest waiting a good 10-15 minutes before applying your top coat to prevent messing up your manicure. Also, I asked Scrangie about which top coat to use that won’t cause streaking, and she said that the Konad brand top coat doesn’t streak because it’s probably formulated differently. Good to know! I’ve already placed an order for that top coat. Will report the results in a future post. I’ve found that if you wait 10-15 minutes, using Seche Vite Dry Fast Top Coat works perfectly. So if you have that, you may not need to invest in the Konad top coat. Then after waiting a little while for your top coat to dry, get your cotton swabs, dip them in nail-polish remover, and remove any polish that got onto your skin. Maybe I’m a messy ‘Konader’, but when I’m done, my workspace looks like this! That’s why I recommend putting down some paper or other material that you don’t mind ruining. 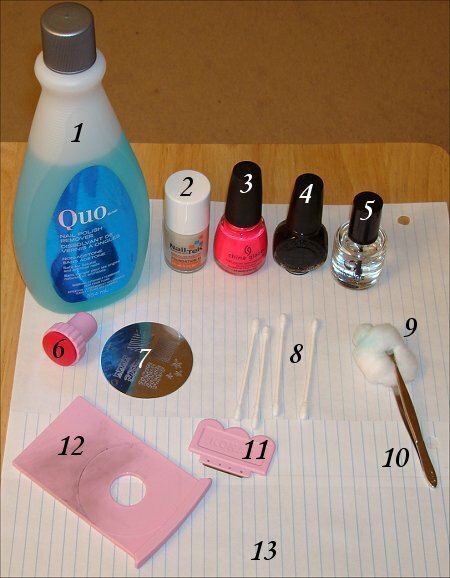 You can use regular nail polish instead of the Konad Special Nail Polish. It should have a thicker consistency and be very opaque to work well. Be sure to test-stamp it first. Don’t buy the metal Konad Scraper like I did. It can scratch your plates & ruin them over time. Instead, get the plastic version they sell or even just use an old credit card. Use generic cotton swabs instead of Q-Tips because the latter are fluffier, and the fluff may wind up on your nails. There are some ‘fauxnad’ image plates you can get that cost less than official Konad ones. Be careful though because some are crappy quality. The Bundle Monster image plates seem to be the most popular. Did you find my Konad tutorial helpful? Please let me know, and also tell me if you have a cool tip or trick! The Konad m57 image disk is one of the most popular ones I’ve seen used on the internet, and I can see why! 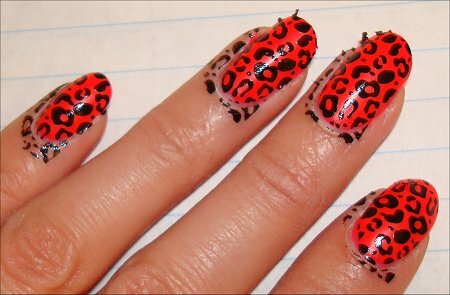 You get 4 full-nail designs (zebra, fishnet, leopard, and lace) including 3 small flowers. 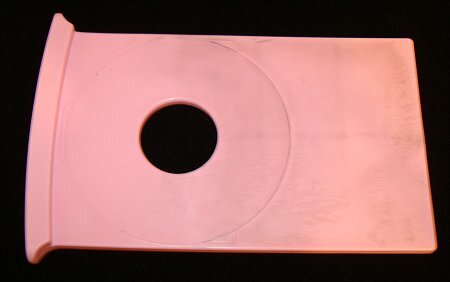 The back of the image plate has thick paper with “konadnail.com” tiled across. 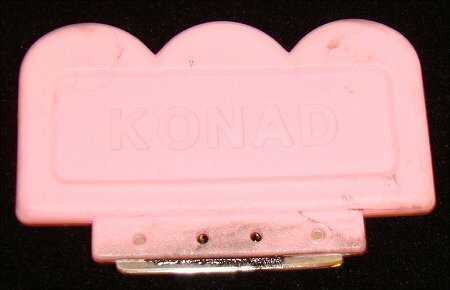 The Konad image disk comes in a clear plastic package with pink detailing on the top. Konad Special Polish is very different than your typical nail polish. It’s very thick. After you’ve stamped the design on your nail, the parts that end up dangling off your nail or that adhere to your skin are very peculiar. They’re stringy, and kinda look like very thin elastic bands. As you can see from my Konadicure swatches near the top of this post, you’ll see that parts of my design are smeared. While this is a fast-drying polish when using it for stamped images (and not for coating your entire nail bed), looks like it still needs a while to dry before you apply your top coat. Keep this in mind to avoid ruining your hard work! Another interesting thing was that when I removed my polish completely, the first thing that wiped away quickly was the black Konad Special Nail Polish. It defnitely is a different animal than your regular polish. I really wanted to get the dual-ended stamper instead of this one, but since it was out of stock, I winded up getting this smaller, stubbier version. It works well, and it’s comfortable to grip, but if you don’t want full-nail designs, I suggest looking for the dual-ended stamper for greater precision. For the zebra-print pattern, it works very well, and I was pleased with the results. 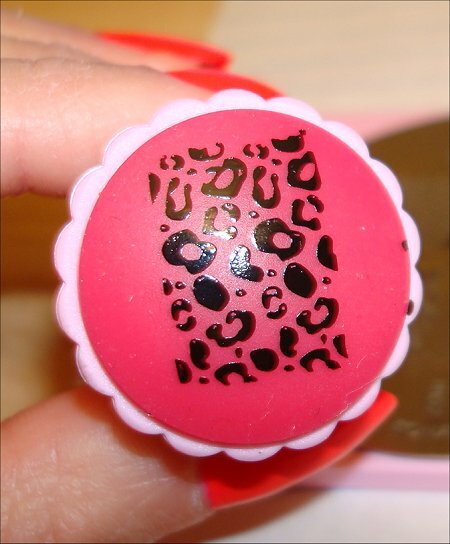 The dark-pink stamp part that touches your nails has a rubbery texture that helps prevent slipping on your nail. This was an extra accessory that you don’t really need. I bought it because I wanted to make my first forage into nail art as easy as possible. But to be honest, the Konad Image Plate Holder doesn’t really make a huge difference. I could just put the plate on my table and hold it to achieve the same results. But since I bought it, I’ll continue to use it. Creating a Konadicure was way easier and quicker than I thought! I’m really excited to try more Konad image disks, and to share my photos and experiences with you again in the future. What are your favorite polishes to use instead of the Konad Special Polishes? Do you know of any good etailers that I didn’t already mention where you can purchase Konad supplies for less? Let me know! 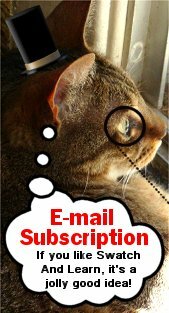 This entry was posted in Beauty Tool Reviews, Makeup Reviews, Nail Art, Product Reviews, Tutorials & Tips and tagged Konad on January 20, 2011 by Mary S.. Thank you so much for this! I keep seeing Konad-ed nails but despite googling I could not figure out how the designs got from the metal plates to the nails. So thank you for solving that mystery for me. From one Mary to another – you’re welcome! 😀 It was fun putting it together step-by-step. Stay tuned for many Konadicures to come! Hi there, i cant even get my stamper to collect the polish, I clean it after each use. Im so agg. w this lol. My 5 yr old is so upset, HELP!!!! If you roll the stamper across the design to pick it up it works best also you have to work quickly. Polish, scrape, roll and stamp. No time to hesitate or look for tools! this helped alot 😀 thanks! Glad to hear it, Cecilie! Are you going to be trying out a Konadicure soon? Thanks for the nice presentation. Do you have branch here in the Philippines? Several of the etailers I listed in the post ship the Konad products to the Philippines, so have fun! It can be very addictive. I’ve just bought my first 2 image plates (m57 and m65) and I’m really excited to use them. Stupid me forgot to purchase the stamper and scraper though, d’oh! Thanks for this tutorial. 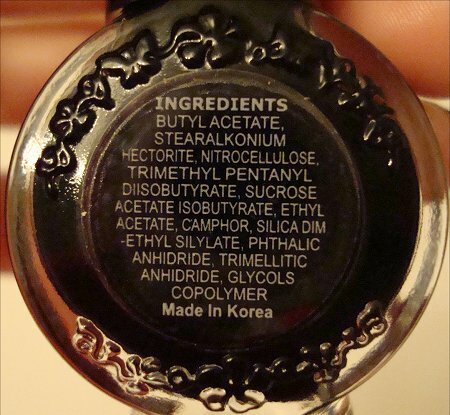 I stumbled onto this looking for a review on the Konad Remover Bottle, but can’t seem to find anything to do with it. Do you have this product and if so how do you use it? Look forward to more blogs from you. Nice choices! The Konad m57 image plate was the first one I ever tried, and so far it’s my favorite – lots of great full-nail patterns. Plus the flowers and lace strips are really versatile. I don’t have m65, so when you try it, please come back and let me know how you liked it. Ohhh, I want to get that Konad bottle, too! Funny, but I keep forgetting to put it in my order when I’m getting more image plates. From what I understand, the bottle makes it possible so you don’t have to pour out the nail-polish remover. 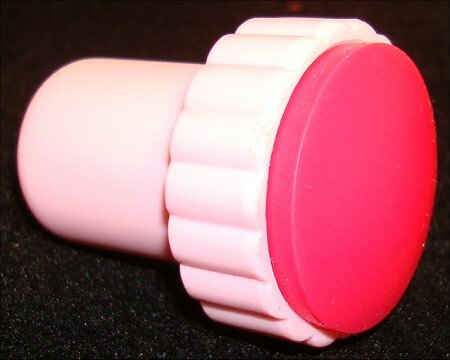 You fill up the bottle with remover, and the top has a pump. To get the remover, all you have to do is flip open the cap, place a cotton ball/round on the top, and press down. The remover will be dispensed while the bottle is upright. 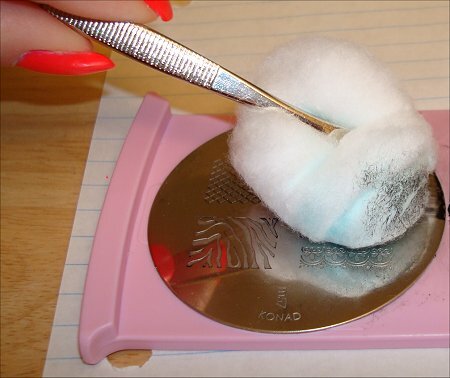 This avoids potential spilling or messes you might get from a traditional nail-polish remover bottle where you have to tilt and pour it onto the cotton ball/round. Hope that helps! Ahh, i see! I had premonitions of it magically taking all the nail polish off from round the nail… slightly silly now I think about it hah. I’ll definitely come back when i’ve tried m65. I only got it for the rose design really, but i’ll try them all and let you know they look. Thanks, Lauren. Hope you’re not having ‘another manic Monday’. It’s been raining here (overcast sky, too), but at least the temperature is so mild. Can’t wait to hear how the m65 plate fares. With a high recommendation, I may just have to put it on my shopping list! I’ve been going Konad crazy since last time i was on here. I LOVE the m65 plate. The roses are especially good! I did a design in black and white to start with, and it looked just like vintage wallpaper which i’m a massive fan of. The other designs are nice too, i like the diagonal beading one for subtle designs, and my mum loves the swirly design. I also bought 4 new plates very recently. I can’t remember their names, but I’m currently sporting a race-car-esque design; red base, with white french tips and black checkered tips over the white. I can’t stop looking at my nails! If you’d like, i’ll try link you to some pictures of my attempts in the next few days. My creative juices are definitely flowing! 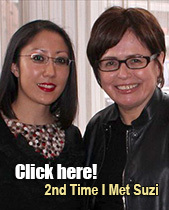 Thanks again for all your help in the blogs! It’s so nice to hear from you again and to know that you’ve been busy being creative with Konad! Thanks for coming back to give me an update on what you thought of the m65 plate. The race-car design sounds very eye-catching! 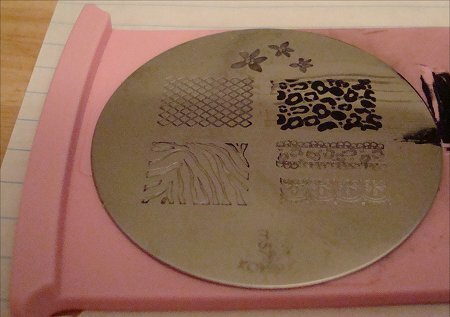 I just got a few “off brand” plates (from born pretty) and a stamper and scraper and was thinking of getting the bundle monster kit from Amazon, BUT I’m not very good at stamping yet! Oh, with just a little bit of practice, you’re become a whiz at nail stamping…and then you’ll get the new Bundle Monster plates and become totally addicted to stamping like I am! Hehehhe! If you take photos of your manicures, I’d love to see them! I’m great. Thanks. Hope you’re well, too. The links for where to buy Konad supplies online are in my post. 🙂 I’m not sure if it’ll be expensive in your currency. There are some online currency converters you can use to give you a better idea of the exchange rate. hiii i have a question? I got my konad stuff but i didnt get instructions? like i know how you apply it to ur nail but what do you do before all that, do you have to clean the plates? or the stamper? what are the prepping instructions? 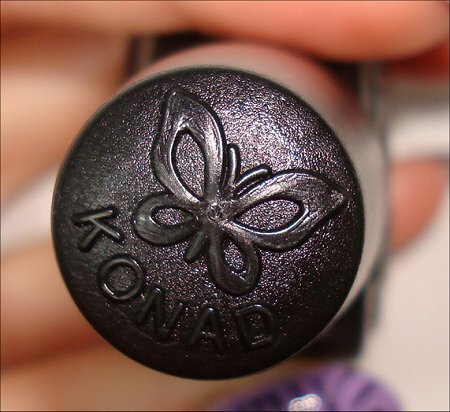 I Just started doing my nails again and have been wanting to get into Nail Art…this Konad tutorial is just what I needed!…I’m gonna put in an order right away…especially for the m57 plate…Just wondering if you’ve tried Konading with other nail polishes?? and if so….which ones worked best??? Yes, I’ve tried Konading with some other nail polishes, but the only one I’ve tried that I’d recommend using because it works well is China Glaze Millennium, which is a beautiful metallic silver. It’s great for stamping on darker base polishes. However, a lot of people have told me that stamping can be done well with Sally Hansen Insta-Dri polishes and some Wet ‘N’ Wild Megashine polishes. You’re going to have TONS of fun coming up with original designs. If you have time, please come back after you’ve tried Konading and let me know how you like it. Sometimes it just takes more practice. Next time try buffing the stamper and cleaning the scraper in between. It made a big difference for me when I tried to get certain designs to transfer. Hope your future attempts get better and better! I just love your website, and I have a question about an alternative stamping polish to use other than the Konad ones, I bought a Konad stamp and a plate not long ago, but I didn’t think about buying/ using the “special” Konad polish they sell to use along with it at the time ( I still do not own any, but I will wait for your reply in order to find out if I do indeed need to get the konad polish to stamp with.) I thought, having several bottles of polish would do (Some China Glaze, some Opi, some Zoya, some cheapies too- I don’t discriminate- lol) But I have no luck with stamping sucessfully, My question is, Is there a way to stamp sucessfully without the Konad polish? 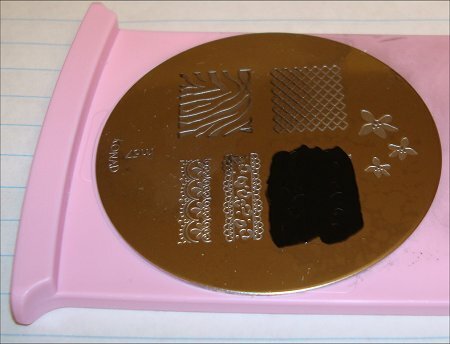 I had a 1990’s stamping kit that used a special stamp polish too, it was rather thick, probably the type Konad uses, once I ran out, the nail stamping set got put away for good…. I am hopeful that there is a way to use ordinary polish to stamp, if not, Konad polish here I come! I’m so flattered to hear that you’ll be referring to my tutorial when you give it a go. Please take photos of your first few tries. I’d love to see what awesome manicures you come up with. And feel free to post them on my Facebook wall! 😀 I’m sure that others would also love to see – it’s very inspiring to see what others can do. I found your page when trying to find design ideas so I know what I want to do when I receive my Konad Nail Art stamping kit. I ordered it directly from Konad. On there you are able to make customized kits with polishes, image plates, a scraper and stamper. I chose to get the largest kit which included 4 special polishes (I chose white, black, silver and pastel pink), 3 image plates (I chose M60, M62 and M69) a stamper and scraper (metal). I ended up paying about $45 CAD, which I didn’t think was too bad really. That included the exchange from USD to CAD and shipping charges. I can’t wait for it to come in, I hope it comes next week so I can try it out! Hehe, yes, Bath & Body Works stuff can be so addictive. And the company is quite clever constantly putting out so many awesome sales. It’s hard to resist sometimes. No worries, Erica. It happens. 🙂 Thanks for commenting! Hmm…I honestly don’t know much about gel manicures since I’ve never had any, so I can’t answer your question. If any of my readers see this and know the answer, please reply and let Gem know! Hi I am thinking of purchasing the starter kit from Konrad, iv been trying to do as much research on it as possible as it is completely new to me! I specialise in gel manicures using bio sculpture gel and Jessical GELeration! What I wanted to know is can you use these stamps on the gels as this is really important for me to know before hand! Thank you, your site is very useful and helpful to me. Wow, I didn’t even see this comment until now, which is why I’m only replying now. Geez! 🙁 Not sure how it slipped through the cracks. I’m not sure if you can use this with gels. I don’t have any experience with them. If any of my readers know, please reply to Gem’s comment! Thank you sooooooo very much for this tutorial. I hit up Google for this & was happy to see it on your site 🙂 I dived into my 1st Konadicure last night & was met w/ some trials & tribulations… LOL but your tips are certainly ones I’ll be taking up in the future. Loved the one about scraping excess onto a piece of paper & thanks for letting us know they also sell a plastic scraper. I’ll have to order one of those as well… This will certainly be pinned!! You’re so welcome! Haha, I did it when I was brand new at nail stamping, so I figured it would be useful for others to see my ‘mistakes’ and all the problems I ran into. Yes, I highly recommend the plastic one. For me, it works very well, and it makes me feel better knowing that it won’t scratch up all my plates. Hi again!!! I just wanted to swing by & say I tried your method & what a difference all your tips made for me. Absolutely wonderful!! As far as Pinterest – I always pin stuff from you as I’m one of your followers & you’ve actually pinned a few things from me. Super psyched about that 🙂 Thanks again!!!! Instead of a scraper, I’ve heard that you can use an old credit card or gift card. As for the stamper, I really suggest you buy that because I don’t know if a generic stamp would work with Konad. Thank you so much for the great intro to Konad, I have been getting really into nails and doing mostly free hand designs. Finally decided to study up on how these stamps worked and this was perfect! Feel free to post any manicures you do on my Facebook wall so that I can see and also so my readers can see! 🙂 We all are inspired by beautiful nail art! Thanks. 🙂 Your tutorial really helped me. I just started stamping, though I’m using Winstonia Store plates, but your tutorial is the best for stamping! So happy that I could be of some help! 🙂 If you ever want to share photos of your manicure on my Facebook wall, please feel free to do so. I’m sure all my readers would love to see…and I would, too, of course!